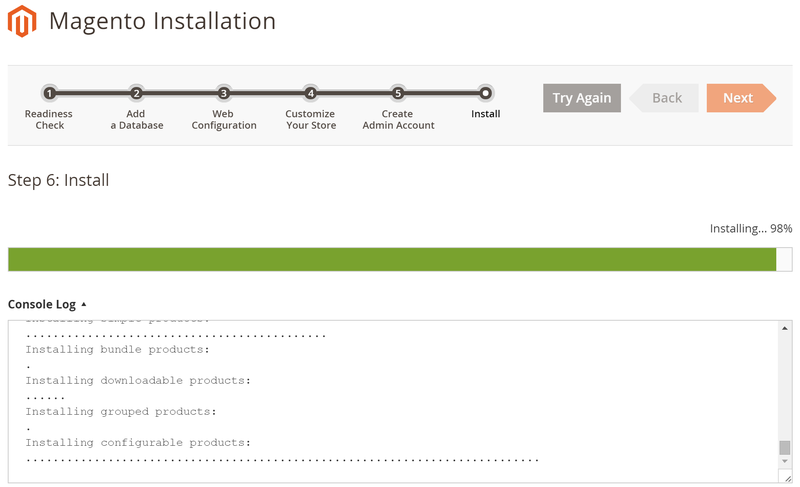 You are installing the Magento 2 Merchant Beta (sweet!) with the Luma Store sample data, and the web installer pauses at 70%. Is it dead you wonder? For me, I waited and it got past this step and continued onwards. But then I hit the 98% pause. Ummm. Is it still alive? If you watch closely, you should see additional dot appearing say every 10 seconds or so. If this is happening, everything is still working. Just be patient and let it load up all that sample data, and accept our apologies the percentage progress bar is not more accurate. The web installer does not take into account some steps take longer than others, so pausing at 70% and 98% when loading sample data is the norm. Oh, and by the way, my laptop did complete the install successfully, but it took around 150 dots. And most of the time was with the progress bar at 98%. The moral of this story? Good things come to he who waits. Thanks. Waited for 150 dots and it worked! Thanks for the post. My installation has paused at 66% and dots does not seems to be increasing. This post was definitely before ga, so may be no longer relevant. I would check available memory – it does work for many. So most likely something about environment. he web installer pauses at 87%. Is it dead you wonder? For me, I waited and it got past this step and continued onwards. But then I hit the 98% pause. stuck on 97% and no dot shows.